CHICAGO, IL, UNITED STATES, August 27, 2018 /EINPresswire.com/ — This study considers the present scenario of the global gambling market and its market dynamics for the period 2018−2023. It covers a detailed overview of various market growth enablers, restraints, and trends. The study covers both the demand and supply sides of the market. It also profiles and analyzes the leading companies and various other prominent companies operating in the market. The exponential popularity and rising number of live casinos will help in the development of the global gambling market during the forecast period. These live casinos have the presence of live dealers and run like a real land-based casino. The increase in e-sport competitions in the form of video gaming or pro-gaming or professional video gaming is driving the growth of the global gambling market. These competitions are multiplayer in nature and RTS, FPS, and MOBA is the most popular games in the global market. These events are often broadcasted live worldwide via streaming platforms such as YouTube and Twitch. The online gambling industry has utilized the opportunity to use digital currency and gambling on blockchain-based platforms to ensure that a higher number of consumers use these modes of payment in the global market. The increasing number of bitcoin and cryptocurrency transactions will augment the development of the global gambling market. Download a sample for more information. This market research report includes a detailed segmentation of the market by product, platform, and geography. Casino segment dominated more than half of the market share in 2017, growing at a CAGR of more than 3% during the forecast period. Some of the most popular casino games are roulette, slots, blackjack, baccarat, and craps. Betting is considered as a gambling activity where wagers are made on the outcome of an unpredictable event, game, or race. The betting segment is classified into two major sub-segments that include sports betting and horse & greyhound racing. The growing popularity of esports betting will boost revenues and help vendors gain a larger gambling market size over the next few years. The land-based segment occupied the largest market share in 2017, growing at a CAGR of over 3% during the forecast period. Mass-market gaming is allowing the operators to gain more profitability and stability, where the customers pay for the money-spinning non-gaming items and help increase the operators’ profitability. The growing popularity of online gambling activities in the APAC and European region will augment the development of this segment in the global market. The ease of convenience it offers to an end-user within the comfort of their home will help the segment gain significant gambling market size over the next few years. The global gambling market by geography is divided into APAC, Europe, North America, Latin America, and MEA. APAC dominated the majority of the market share in 2017, growing at a CAGR of around 3% during the forecast period. China & SAR, South Korea, and Japan are the largest revenues generators in the APAC region. The rise in per capita disposable income, increase in ownership of smartphones, and exponential proliferation of mobile gambling applications are some of the factors contributing to the growth of the Latin American region in the market. Argentina occupied the largest gambling market size in Latin America in 2017. The global gambling market is highly concentrated with the presence of several regional and international players. The increasing focus on continuous innovations and upgrades to support digital platforms and sustain the intense competition in the global market. Various companies are expanding their businesses to developing countries such as India and China to tap potential opportunities in the market. Factors such as an increase in product or service extensions, technological innovations, and M&A are expected to intensify the competition in the global gambling market during the forecast period. Furthermore, the presence of established international vendors, consumer loyalty, and a shift in consumer preferences are major entry barriers for new players. Other prominent vendors include AsianLogic, Betway, Betfred Group, Betsafe, Betsson, Bet-at-Home, Bwin, Camelot Group, Casino Cosmopol, Caesars Interactive Entertainment, Casinoeuro, Casinostugan, Casumo, Comeon, Expekt, Folkeautomaten, Gametwist, Genting Berhad, GVC Holdings, Interwetten, Jackpotjoy, Kindred, Leovegas, Mr. Green, Mybet, Mobilbet, Nordicbet, Norgesautomaten, Norsk Tipping, OnlineCasino Deutschland, Pinnacle, Playtech, Rank Group, SJM Holdings Limited, Sky bet, Stargames, Sunmaker, Sportech, Svenska Spel, Tipico, Vera&john, Win2Day, Wynn Resorts, 1xbet, and 888 Group. 1. 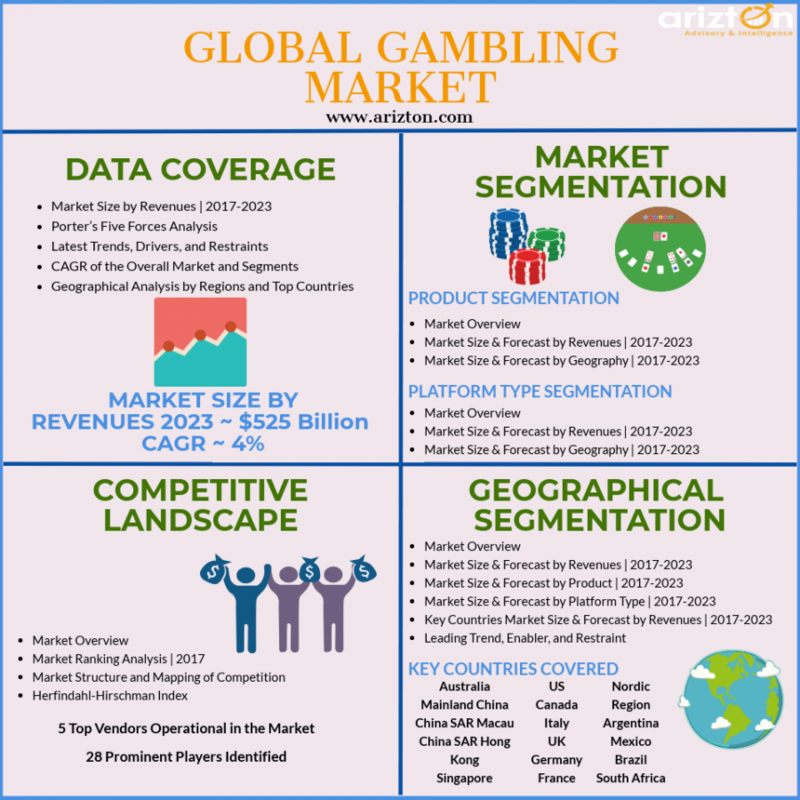 The analysis of the global gambling market provides market size and growth rate for the forecast period 2018-2023. 2. It offers comprehensive insights into current industry trends, trend forecast, and growth drivers about the global gambling market. 4. It offers a complete overview of market segments and the regional outlook of the global gambling market.